The first time you ever walk into a casino is an enlightening experience. You see a crazy amount of money being won and lost in a matter of seconds. And that’s just on one table. Look around and there are many more. When I started visiting casinos I was barely 18 years old, and I would often see a single player win or lose $10,000 in one spin of the roulette wheel. Back then I didn’t have the option of online casinos – they didn’t exist. 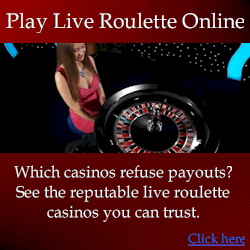 Nowadays you can even play roulette online at william hill live casino, or one of the many other licensed online casinos. On that note, I suggest never play at an unlicensed casino. Even if they have good reviews, because they are easily faked. At least a licensed casino like William Hill needs to abide by strict regulations. The sheer volume of money changing hands is what got me thinking that if I could somehow develop a system, it would be my ticket to an endless supply of money. Back then I didn’t understand much about anything related to gambling. Like most players, I developed my own variety of gambling systems for all sorts of games. I focused mostly on roulette because I found it most exciting to play. And for around a year, I was constantly winning with a roulette system using dozens and a betting progression. I was convinced I had finally beaten roulette, only to eventually find a year later that my system tanked – just like most other systems. Now we’ll skip forward 20 years. 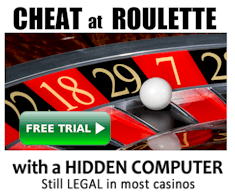 Without going into too much detail, I’m one of the few professional roulette players, and have developed various technology and systems to beat roulette – which actually work. For example, I developed the world’s only automatic electronic device to measure ball and wheel speed to predict winning numbers. But this article is not about what I do. It’s to explain which gambling games are best for professional players. Advantage play is simply the casino’s term for “systems that work”. An example is a system that finds and exploits physical imperfections of a roulette wheel, which make some numbers spin more often than usual. Blackjack card counting: This is probably the best known. Simply the player’s track which cards have been dealt, which then tells them which cards have not yet been dealt. Craps dice control: this is also known as controlled shooting, dice setting, or die control. Simply the player throws the die in a consistent manner to make specific combinations of numbers more likely to appear. There’s a lot of debate about whether or not this is actually possible. Mostly the people that doubt its feasibility are players who have never tried it. One well-known casino consultant tested dice control by dropping dice straight down onto a table for thousands of spins, then observed if there was any predictability to the results. He concluded there was no significant edge possible. However, the problem with his experiment was the dice was being dropped straight down onto its flat side. And in that case, the dice may roll any way. It would be virtually unpredictable. But proper dice control involves rolling the die along a specific axis. This roll makes it more likely for the dice to end with a specific side of the dice facing up – which is along the rolled axis. In my experience, dice setting is indeed feasible. But the possible edge is very small when compared to other games. So What’s The Most Profitable Casinos Game? An inexperienced player would probably recite the odds of each game, and tell you which has the best odds. But this isn’t what makes a game profitable. The critical thing to understand is all advantage play is about odds vs payout. This specifically means you have a highest return on investment. For example, for every $100 you wager, you may expect $115 back. This additional amount is your “edge”. Additionally, time is a major factor. One game may give you a higher edge, but it may take longer to profit from the edge. A classic example is you may have two different roulette wheels. One wheel is very easily beaten, but spins only once every 5 minutes. Another wheel has a weaker edge, but spins very frequently. Generally the wheel that spins more frequently will be more profitable because you can play more spins. Ultimately though, you need to carefully weigh up the edge vs frequency of spins to determine which will give you the highest profit per hour. So what game is most profitable? It depends on which can be best exploited at the time. A true advantage player doesn’t necessarily stick to the same game. They will take the time to evaluate all the casino games, all the wheels, the tables and overall conditions throughout the casino. Then they will properly asses the specific game and table that will most likely give the most “profit per hour”. My preferred game is roulette for two reasons. Firstly I find it the most exciting game. I love the whole idea of a spinning wheel and bouncing ball. Secondly, the overall profit per hour is higher than any other game. For example, my roulette computers can achieve an edge of over 120%. Keep in mind the house edge is only -2.7%. Even in the best possible conditions, a 120%+ edge is simply not possible with any other casino game. But the typical edge my teams achieve is about 30%. Still a lot higher than the house edge, so you can understand why roulette is my game of choice.